For whatever reason, the people at Groupon think that repeatedly sending a different person to call/email me will eventually result in me submitting to their corrosive program that hurts small businesses. I’m tired of responding politely, so here was my latest exchange with the rep assigned to me. And yes, before you point it out, I’m quite aware of how childish I am. This entry was posted on January 26, 2012 by Scott Metzger. 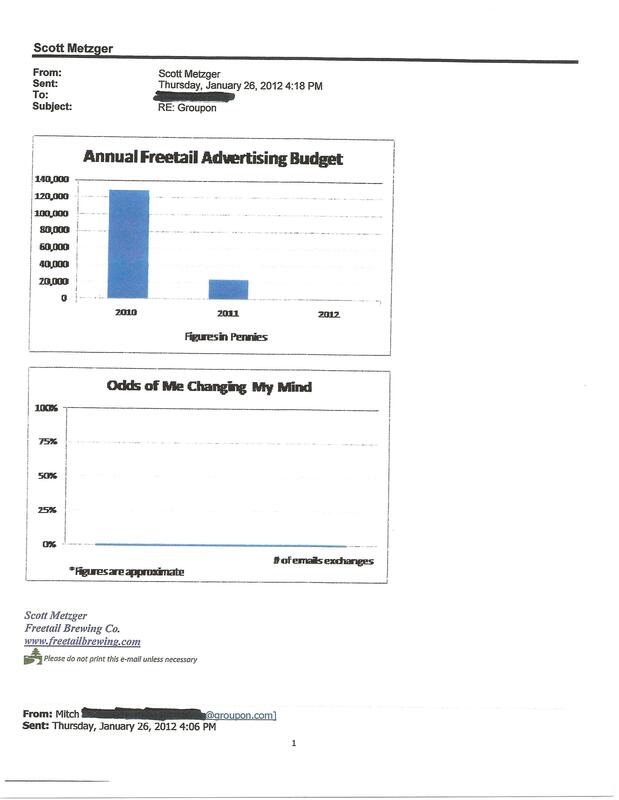 It was filed under Freetail, The Way Scott Responds to People . Scott, I hate to tell you this, but your communications just seem a little vague. Solution: dinosaur. Egh. Should’ve sold to google, then Mitch wouldn’t have to work so hard….or at all for that matter. Poor Mitch. I’m sure he means well. 🙂 Your responses are spot on though. Groupon asks businesses to sell their products/services for less than half what they are worth in the marketplace. An unfair practice if you ask me. 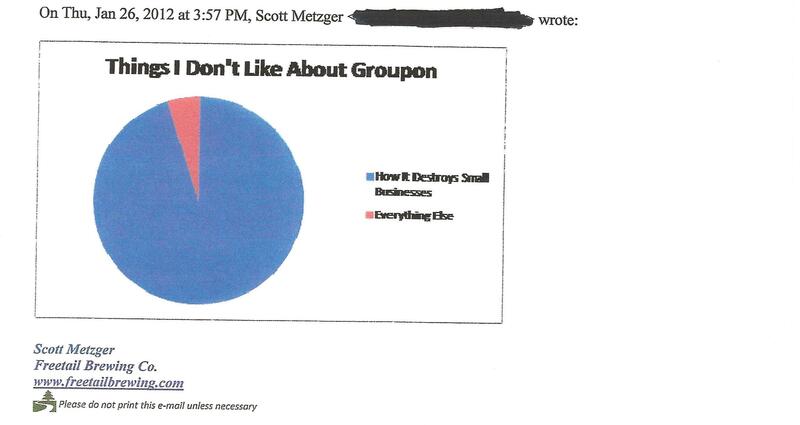 As a groupon user, I agree that it is not good business. I either A: take advantage of a ridiculously low price, or B: get a great deal at a place I would spend full price anyway…either way, it only helps myself, and not the business. Hey Tucker – certainly it does work for some businesses. And I think it’s great that you’re the type of person who will return to the business if you like them (but this is not the case with a large portion of Groupon customers, as revealed by research). 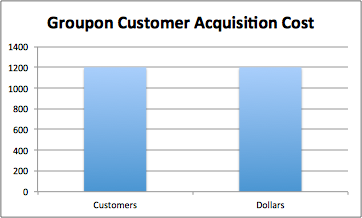 From an academic perspective, Groupon will work if it either a) allows merchants to tap into a more price sensitive demographic (as Groupon and similar site are form of price discrimination) or b) acts as an advertising tool that introduces new customers to business who will then turn into repeat customers if the enjoy the service/products they receive. On the first point, Groupon and similar sites have a shortcoming in that they not only attract the price sensitive customers, but lot of existing customers who would have just as well paid the regular price – so it does not effectively segment the customer types and serves only to devalue the business’s products and services all together. And on the second point, Groupon customers have proven to generally NOT be repeat customers, but ones who merely jump from one deal to the next. I think the recent success of McDonald’s Living Social deal is an indication of this kind of psychology. In any event, you are right – Groupon is a voluntary transaction for a business and businesses can say no. I have my own academic beliefs about the value of sites like Groupon, but my response to them was more about my frustration with the never-ending sales pitches than it was about those beliefs (which I do hold fairly firmly). Personally, I have little interest in using coupons at businesses I really enjoy (which tend to be of the smaller, more local variety). I am happy to pay full price for their products because I value said products and I want to see those products continue to exist in the future, which can only happen if those companies can stay in business. All coupons, not just the recent trend of online deal sites, put downward pressure on a merchant’s pricing power which *can* be destructive in the long-run. Props to those businesses who have use such coupons and deals to their advantage. With that said, I agree that Groupon and similar sites are great for consumers in the short run (so long as the businesses they enjoy stay in business). This is a pie chart of my favorite bars. And this is a bar chart of my favorite pies. I work with groupon a couple of times of year and it does not hurt my business at all in fact with every groupon it will increase my business about 10 times the amount I lose on my product. Every business owner that loses a ton with groupon is a fool and does not understand their products. That is good business sense. Don’t blame groupon when you don’t understand your own business model. Groupon does not tell you what you need to do or even tells you that you have to sell a certain amount. You tell them your terms. Groupon can be a great model of cheap advertising you just need to use it correctly. You don’t blame other advertising resources when you don’t know how to use them. I’m glad Groupon worked for you. Michael, the problem isn’t that businesses don’t understand their own business model at all it’s that they don’t fully appreciate the effect of these coupons. My margins are around 24% but my ability to provide my service all over South Texas when my competition struggles to cover a territory 1/30 my size is why I can make money and keep the competition at bay. I would be foolish to use Groupon. That I understand this is important but what is far easier for me to understand is that I just can’t handle many more customers than I have. If I were struggling in this tough economy and in need of repeat customers it might be harder for me to see how Groupon wouldn’t work in my business. The folks at Groupon (at least on the sales end) generally don’t care if they understand the client’s business model. Groupon sales people aren’t saying, “please make sure you have enough profit in your business to sustain this type of marketing.” What they are trained to do is focus on the positive, what their differentiating business proposition is, e.i. we cost you less per customer than radio and TV and we cost you nothing if it doesn’t work. I certainly understand why Freetail wouldn’t consider using them. Mitch’s chart really doesn’t make any sense. 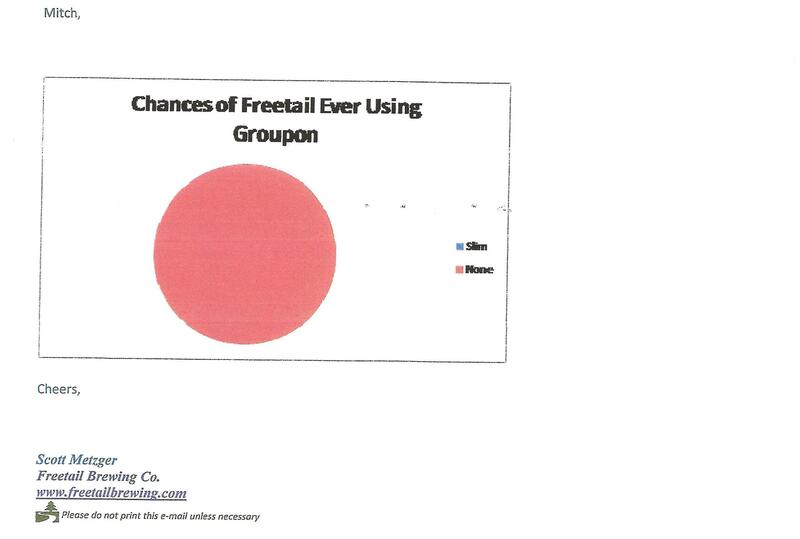 His graph clearly shows that for every $1 you spend advertising with Groupon, you gain 1 new customer for life. I’m stunned that Scott rejected such a generous offer! Hahahaha. This thread did much better advertising for your business than Groupon ever would. If there is a chance to grab some of your beer here in San Diego, I’d gladly buy some. Well played, sir, well played. Once again, your communications provide a laugh for the rest of us. Appreciate it! However, just a point, unrelated to Groupon, that I wanted to touch on is this: The widespread practice of interchanging advertising and marketing. Advertising is all the crap we associate with big beer (and is a simple subset of marketing). To me, marketing, is the overall strategy of using a variety of tools to create awareness/sell more product….and what is most often overlooked in craft, forging of connections with customers. As for Groupon, I agree with you, and I apologize for taking this comment on a tangent. I wish I had a cool graph to represent it. Once again, your communications provide a laugh for the rest of us. Appreciate it the message and the deliver! However, just a point, unrelated to Groupon, that I wanted to touch on is this: The widespread practice of interchanging advertising and marketing. Advertising is all the crap we associate with big beer (and is a simple subset of marketing). To me, marketing, is the overall strategy of using a variety of tools to create awareness/sell more product….and what I see/hear most often is to eschew marketing (because that’s what big fizzy beer people do) instead of viewing it as an opportunity to forge and strengthen connections with customers. My strategy is to maximize 2 and 3 so you never have to spend a penny on 1. As a marketer (and homebrewer and a lover of craft beer) I am glad to see your assessment and break-down. Keep up the great work, and thanks for keeping it simple and straight.